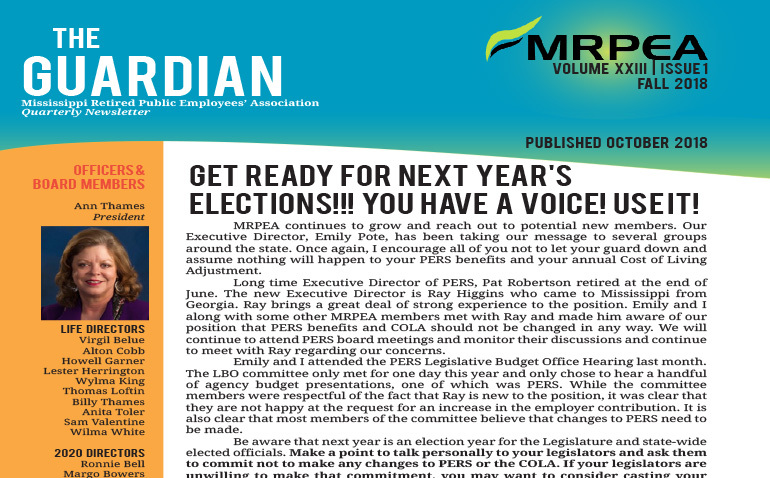 The Mississippi Retired Public Employees’ Association has made its position clear in regard to the state’s defined benefit pension system that serves most state and local employees. The pension system is not to be touched. The organization said in its fall newsletter that it will not tolerate any changes to the Public Employees’ Retirement System of Mississippi. The organization said the best way to defeat legislators who weren’t “supporters” of PERS was at the ballot box. With a bloc of 324,944 possible voters concerned with PERS, that’s no idle threat. It’s little wonder that even small attempts to alter the pension system legislatively have been met with serious resistance. Recommendations proposed by then Gov. Haley Barbour’s study group in 2011 are gathering dust in a closet in the Capitol. It’s a short-sighted viewpoint as the pension fund continues to struggle —only 61.5 percent fully funded — despite a booming stock market. It would be far easier and cheaper to make some reasonable reforms now rather than waiting for another crisis. The MRPEA also says hands off to the cost of living adjustment that’s becoming a bigger drain on PERS’ resources. PERS provides a COLA that amounts to 3 percent of the annual retirement allowance for each full fiscal year of retirement until the retired member reaches age 60. Upon reaching that milestone, the three percent rate is compounded for each fiscal year. Since many PERS retirees elect to receive the COLA in one lump sum at the end of the year, it’s called the 13th check. In 2005, the amount PERS pays for the 13th check was $211 million. In 2017, that figure grew to $603 million. This bigger COLA is because the number of PERS retirees is increasing rapidly, surging from 62,000 retirees in 2005 to 102,000 in 2017. That’s an increase of nearly 60 percent in only 13 years. Mississippi taxpayers are already paying a higher bill to keep PERS afloat. Thanks to a June decision by PERS’ governing board, taxpayers will already have to pay $75 million in additional employer contributions for state employees, with local governments having to contribute $25 million. The PERS board increased the employer contribution from 15.75 percent to 17.4 percent, necessitating a bigger appropriation in this year’s upcoming Legislative session. The MRPEA needs to face reality — that without reforms that improve the plan, the plan will eventually run out of money. The question is how long will that take, as the 2008 recession took a huge bite out of the pension fund’s bottom line and another downturn could be a body blow. Reforming PERS is the only way to save it and the only difference is doing it now, when it will be cheaper and easier, versus later, when it will be far more expensive.